ExplorViz is an open source research monitoring and visualization approach, which uses dynamic analysis techniques to provide a live trace visualization of large software landscapes. 20.02.2019 Our paper "Live Visualization of Database Behavior for Large Software Landscapes: The RACCOON Approach" was published in the series Technical Reports of the Department of Computer Science at Kiel University. A preprint can be fetched here. 11.02.2019 Today, we released version 1.3.0 of ExplorViz. It is the first version based on our new microservice architecture. You can download it from the download section. 06.02.2019 Our paper "Hands-On: Experiencing Software Architecture in Virtual Reality" was published in the series Technical Reports of the Department of Computer Science at Kiel University. A preprint can be fetched here. 12.12.2018 Today, we released version 1.1.1 of ExplorViz. It is the last version based on the old Google Web Toolkit (GWT) architecture. You can download it from the download section. In the next weeks, we release an up-to-date version based on the new architecture. 16.10.2018 Our paper "Simplifying Software System Monitoring through Application Discovery with ExplorViz" has been accepted at the SSP 2018. A preprint can be fetched here. 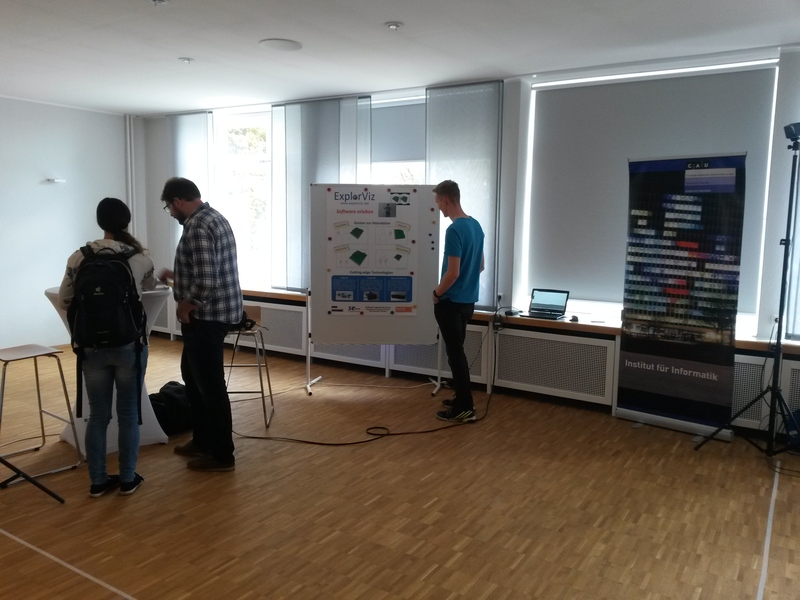 14.09.2018 We presented ExplorViz with our improved Virtual Reality approach at the local event "Digitale Woche Kiel 2018". Exhibition visitors were able to check out our latest version in order to explore and understand a software system in VR. 06.03.2018 Our paper "On the Modernization of ExplorViz towards a Microservice Architecture" has been accepted at the EMLS 2018. A preprint can be fetched here.